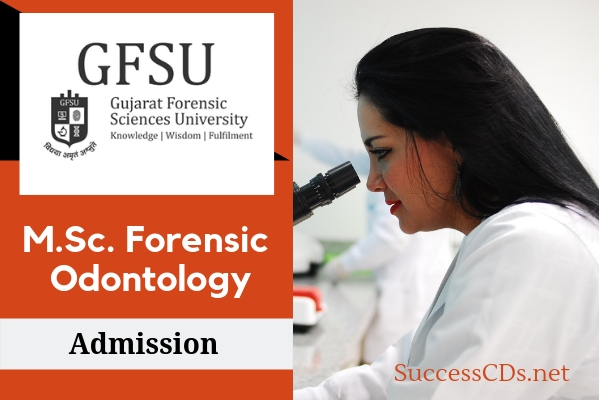 GFSU MSc Forensic Sciences Admission - Gujarat Forensic Sciences University Gandhinagar invites applications for GFSU admission 2018 to M.Sc. Forensic Odontology for the academic year 2018-19. Gujarat Forensic Sciences University, a super specialized University established by the Govt. of Gujarat (recognized by UGC) invites applications for admission to the following unique and highly indispensable super specialized courses. The candidate should be holding a Bachelor of Dental Surgery (BDS) with minimum 55% and for SC/ST candidates minimum 50% of marks from any institution recognized by the Dental Council of India.